The Ministry of Energy and Minerals is responsible for energy (both renewable and non-renewable) and extractives including minerals and hydrocarbons. Somaliland is one of the most potential countries to be an oil producing country. East African countries have experienced great successes in making major oil and gas discoveries such as in Uganda, Kenya, Tanzania, Madagascar and Ethiopia. Somaliland hopes to be part of this growing East African oil patch. For the past 8 years, the Ministry invested great deal of effort and time in marketing its petroleum potential. There are presently a number of international oil companies operating in Somaliland. Two of those companies took part in a recent major multi-client seismic project, managed by the Ministry and conducted by BGP Inc, A Chinese national company which is the leading company of onshore seismic. These companies acquired a total of 4,300km of 2D seismic and the data is currently being processed and interpreted. First exploration well is to be drilling second half of 2019. In addition to the most recent seismic, good quality 5,300km of marine 2D seismic and 34,000km of high resolution onshore aeromagnetic acquired by TGS-NOPEC in 2008 is currently in the market. The current Somaliland hydrocarbon blocks scheme which is one degree one block offers investors enormous area of land (12,100km3 per block). Somaliland is part of the highly productive Mozambique belt and has even greater potentiality in minerals. The known minerals in Somaliland include; precious metals, base metals, coal, rear earth elements and a wide range of gemstones, as well as industrial minerals such as cement material, gypsum, feldspar, quartz, mica, marble and others. Recent gold discovery in Sanaag region is a good example of the economic significance of Somaliland mineral resources. Many of the gemstone variety are also of good quality but presently mainly exploited by local miners in small scale mining and with simple tools. There are also huge quantities of mineral-rich black sand along much of the Red Sea cost as well as huge deposits of pure gypsum and anhydrites. Somaliland also has some of the best decorative stones in the world in the form of variety of granite, gabbros, syanites and marbles. Current activities include gemstones, metallic minerals, jade and feldspar licenses & operations by international investors. 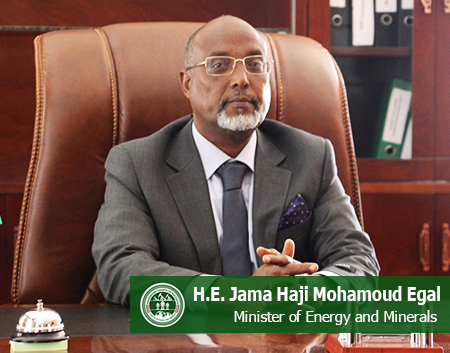 The Energy policy was approved in 2010 and it is currently being reviewed and updated by the Ministry, the Somaliland Energy Policy promotes in fostering international partnership in trade and investment in the Energy Sector, while the Somaliland Electrical Energy Bill was developed by the Ministry and has been passed by the Legislature, but due to missing important chapters, the President suggested for an amendment and currently the amended version of the act has been sent back to the parliament for final approval. The Ministry developed interim sets of regulations such as licensing, minimum technical health and safety standards and electrical power distribution network expansion guidelines. As a result of many workshops conducted by the Ministry and consultative meetings held for the private electricity service providers (ESPs), their level of education and awareness has increased and that resulted in the ESPs to merge to get economies of scale in order to provide better service to customers. institutional, regulatory as well as infrastructural requirements of the energy sector. Under the Ministry’s direction and oversight, multiple energy programs are ongoing in the country that include a major program called Energy Security and Resource efficiency program (ESRES) funded by DFID. The main purpose of the ESRES project is to improve the access of affordable electricity for vulnerable communities through the promotion and usage of renewable energy technologies. The project entailed building six hybrid mini-grid projects in six Somaliland towns (Gabeley, Borama, Sheikh, Burao, Buhoodle, and Badhan) and was completed this year-2018. The project contributed a total of 2,700 KW of additional power to these towns, resulting in adding 10,307 new connections. The project also created 487 positions of temporary and permanent employment. Another successfully completed project managed by the Ministry was, the Somaliland Energy Transformation Program (SET) funded by the EU which focused on isolated villages, in Somaliland. Targeted rural communities were supported with installation of solar powered pumping systems for shallow wells and boreholes, many schools and healthcare centers (MCHs) were also powered with Solar PV systems to provide electricity. It is the aspiration of Somaliland as a nation and the priority of the current government to enhance our meager economy and increase production by exploiting our natural resources for the benefit of our people. This will to a large extent require investment of foreign companies as well as the support of the international development partners. Hence, Somaliland has established transparent and conducive arrangements to attract such investors and development partners. It is imperative that we appreciate the importance of this journey and understand the transformative affect in which finding vast deposits of minerals and getting cheap, reliable and sufficient energy (through the exploration and exploitation of fossil fuel and harnessing renewable energy resources, developing an outstanding electrical power infrastructure both transmission and distribution) can have on our economy.